The hysteria of the anti-LRT lobby – Time to get real! 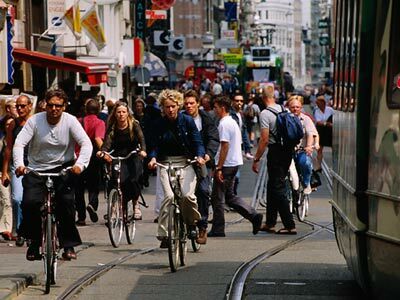 On other local and US blogs, there is a growing hysteria that once light rail (streetcar or tram) operates on-street, there will be general panic among pedestrians, ultimately throwing themselves under the tram! Shades of the 1820’s railway hysteria, where trains were claimed to cause insanity and sour cows milk! I’m sorry to say, that light rail in its various forms operates quite safely in hundreds of cities around the world and mass panic and hysteria among the locals – definitely is not. What we see is a well orchestrated lobby by the anti-LRT crowd to create an aura of panic among the misinformed public, then pursuing their own interest to support more roads, highways and metros. In Vancouver, the subway/SkyTrain Lobby is full tilt at it sowing misinformation everywhere they can so they can reap an anti-LRT backlash. Invented stories, debunked myth, and perverted statistics are the norm with this crowd as they pursue their very expensive metro agenda. The results of this effort of mass confusion is of course is to continue our merry way of building metros on routes that do not have the ridership to sustain them and creating financial chaos with TransLink; ever higher fare increases; and new road and highway building programs. We seem to keep doing the same thing over and over again, ever hoping to achieve different results, but in the end achieving nothing but higher taxes and more congestion. Why then does LRT operate on-street, in mixed traffic in city centres? It is what the transit customer wants – transit, on the pavement and easily accessible. It is a winning prescription to help solve our crowning traffic gridlock and associated pollution. The simple availability, affordibility and universally accessible light rail transit will define a successful city for the 21st century. This entry was posted on January 5, 2010 at 7:22 am and is filed under Uncategorized. You can follow any responses to this entry through the RSS 2.0 feed. You can leave a response, or trackback from your own site. As with everything, there are pros and cons. Safety is likely due to cultural attitudes towards trams, plus progressive attitudes about cars in the city. In North America, there will be a steep learning curve – not to say we shouldn’t attempt it, like on the vancouver streetcar plan, but we have to be aware of it. A big issue for me is travel time. The second photo above shows a gauntlet track, where due to space constraints on-street trams share 1 track for 2 directions. It does lead to more pedestrian action on the street, but encourages tram bunching and trip delay. LRT should work well in metro along the KGH median and the SRY railway ROW. Tram can be implemented successuflly along the planned vancouver streetcar route. For intense growth-shaping (evergreen) and high volume corridors (UBC/broadway) it should be automated metro. Zweisystem replies: I disagree completely. First, what you are referring to is a tram or streetcar in a city centre. I have seen gauntlet track in action and I am surprised how fast trams can go on it. What you see is what the customer wants, transit on the pavement, easy to use, not a metro with a stations a kilometre apart. In Europe, it was found the metro increased journey times for commuters when they replaced trams! Will the Evergreen Line carry 20,000 passengers an hour or more? If the answer is no, then it will be heavily subsidized an the rest of our metro system is..
Who will pay the extra subsidies? Here is the simple problem that is overlooked by politicians and many local planners: Building automated metro just drives up the cost of transit, with little or no benefit. There is little evidence that SkyTrain, with over $6 billion invested in the metro, has created the all important modal shift from car to transit. Yet we continue on this path. The RAV/Canada Line is another example. In capable of carrying the over 20,000 persons per hour per direction that is needed to justify automation, the metro is utterly useless for Richmond residents to commute within their city. More and more it looks like the RAV/Canada line is a con, by Premier Campbell to provide his political friends at YVR with a prestigious, yet almost useless fast ‘rapid transit’ link, while Richmond got second prize, a bargain basement metro. It seems that the ridership growth (what little there is) is mainly poorer people getting to the casino to be relieved of their cash. In South Delta, where I live, I notice fewer and fewer passengers on the 600 series of buses, as many former transit customers are reluctantly reverting back to the car! What is also not reported in the mainstream media, is the exodus of downtown businesses out of Vancouver and into Burnaby or transit poor Surrey, due to ever higher taxes and the inability to attract customers. Page and Wilson is just one example. This blind faith that metro will solve our transit problems is built on a foundation of pure ignorance and a lack of understanding of how public transit is supposed to function. History is ignored, while great expenditures are made on the next gadgetbahnen that will solve out transportation problems. We are rapidly making the METRO region unlivable with very expensive transit solutions and the high taxes to sustain them. After the Olympics there will be a reckoning as the taxpayer will be crushed with a vast debt load. Drivers do have trouble with trams, but they have trouble with pedestrians and other drivers too. Every morning I wake up to a traffic report filled with accidents around the region. Blaming the tram for what is almost always the car or truck’s fault is misleading at best. Travel time is a very interesting topic because it’s necessary to see who you’re trying to serve. If the goal is to move people from the existing SkyTrain to UBC then metro is going to win the race because it won’t stop as often as a tram. But if the goal is to provide the region with an efficient travel network then spending $3-4 billion on a Broadway metro would be a terrible decision. That money would buy LRT on Broadway, tram train from Chilliwack to downtown Vancouver, and a third line of your choosing. Evergreen using the Lougheed corridor to Maple Ridge perhaps? Metro is also the wrong choice for Broadway itself. Stations would be widely spaced and passengers would, on average, need more time to reach one than they would with a tram. Total travel time for most people coming from or going to destinations on Broadway (not UBC) would be roughly equal to the “slower” tram. Furthermore, Coast Mountain would have to keep operating the #9 bus to serve the space between the metro stations, much like they still run the #15 to fill in the gaps in the Canada Line. Our transit system, like most around the world, is facing ever increasing operating costs that threaten to destroy it. The last thing we need is more construction debt and high operating costs. A tram that costs significantly less than metro to build, less to operate and replaces a bus route is the kind of sustainable solution that we need, not more SkyTrain. Then you would be approaching replacing a local service electric trolleybus with a local service tram, spending millions in the process to get similar travel times. The Spadina LRT ROW has been operational for 10 years in toronto. The volumes of passengers has risen dramatically since the improvements, but travel times have not changed even with the ROW. What will happen to a tram in mixed traffic, let alone LRT in on-street ROW? Automated metro is expensive – but we don’t need it everywhere. IMO Tram/LRT is still needed in metro vancouver, but we need metro for evergreen and broadway/UBC. Zweisystem replies: Wrong again Mezz. Operating trams on Broadway would be much cheaper than operating trolley buses. 1 tram (1 tram driver) is as efficient as 6 buses (6 drivers). trams are faster than buses, even without reservation. If upgraded to LRT standard (reserved rights-of-ways), the commercial speed provided by trams would equal a metro. The problem in Toronto is that there are far too many tram stops per route km. thus reducing commercial speed. Buses on Broadway have almost reached their practical limit, yet there is plenty of spare capacity by using light rail at a fraction of the cost of a subway. Who is going to pay for the Broadway subway? I doubt Valley politicians would agree to fund any more SkyTrain in the future. Just wait till the Olympic bubble bursts, there will not be much appetite for any mega/subway project. I do want to advocate for better transit in metro, but I have to know why we advocate for skytrain, LRT and tram. As regular user of the 510 Spadina car I wouldn’t agree with your assessment that the reason for the lower speed is that their are too many stops/km. While in my opinion there are a couple that could certainly go, the majority of the stops are heavily used. Increasing speed through thinning out the stops would simply transfer that travel time to riders as they will have to walk the extra distance to or from their destinations. Compounding this issue is the number of elderly passengers that seem to use this route. I’d hate to see them (or perhaps me in a few decades) have to walk an extra few hundred meters when solving other problems could increase the overall speed of the route. Zweisystem replies: Thank you for your input. Not having been to Toronto in a very long time, I have to rely on other’s observations. Certainly a lack of priority signaling would increase journey times and I am puzzled why Toronto has not invested in it. In Vancouver, many highly used auto intersections have priority signaling with inductive loops beneath the pavement to give priority to the most heavily used route. It also could be that tram car design tmay create longer dwell times at stops, thus increasing journey times. In Europe, 15 second dwell times are the norm and the trams have spacious entrances and exits to speed loading and unloading. Certainly the new low-floor cars for Toronto will greatly decrease loading and unloading times, especially for the elderly and mobility impaired. As for the mobility impaired, I know of one elderly gentleman who regularly used the bus to go to Vancouver has now given up using public transit as he finds the new Canada Line to slow and cumbersome for his needs. Evidently the stations were not designed for the elderly. I have only been to Toronto twice. What I’ve seen of Toronto streetcars is that they’re old fashioned high floor vehicles that look like a bus on rails. There seem to be two models: a single unit with two doors like a standard bus and an articulated vehicle that has three doors just like our articulated B-line and trolley buses. If passengers are compelled to load only via the front door like they are with most buses then loading times would definitely be long. The new models Toronto ordered from Bombardier are low floor vehicles with multiple articulated segments and more doors. The low floor alone will reduce dwell times a bit and if all-door loading is used like it is on the subway then dwell times should drop significantly. I’m looking forward to riding the Bombardier Flexity trams on the Olympic demonstration route. They represent the type of vehicle that Vancouver should get for Broadway. As for station spacing, simply doubling the number of stops from the current #99 B-Line service should allow the local #9 to be discontinued. Only the most frail in our society can’t walk an extra block and many who might find that a struggle would discover a stop featuring significantly more seating and protection from the elements than a standard Vancouver bus stop, perhaps making it worth the extra walk. All-door loading, reserved lanes, signal priority and perhaps a higher speed limit would allow a Broadway tram to reach UBC noticeably faster than the B-Line does. Elsewhere in the world trams are permitted to exceed the posted speed limit by 10km/h and let’s be perfectly honest, where in Vancouver does anyone drive only 50km/h except when hindered by congestion? The tram would simply be permitted to do what the rest of the traffic already does illegally. Priority signalling could be used to speed up the B-Line, but Broadway’s biggest problem isn’t a lack of speed it’s suffering from a lack of capacity. Simply providing more capacity, even without speed improvements, would please everyone who travels in the area. TransLink is broke and operating costs are the primary culprit. Running a B-Line bus every 2 minutes is very expensive compared with running a tram every 10 minutes. Quick tip on style. If your goal is to combat hysteria, it’s important to avoid sounding hysterical or enraged yourself. This post will fan hysteria, not combat it. Mode choice tradeoffs are about a complex mix of variables and impacts. They are extremely hard decisions even when everyone involved is being rational. For example, the problem with LRT mixing with intense pedestrian spaces is not that it’s unsafe (though that objection needs to be dealt with) but that to be safe it has to be very, very slow. So it all depends on what kind of travel times you want to achieve. Many people in your region really like the speed and reliability offered by the current SkyTrain product, and are willing to go into elevated or underground stations to get that product. No solution that mixes with pedestrians will deliver SkyTrain reliability, frequency, or travel time. If you’re arguing that this is OK, then fine, make that argument. But hysterical accusations of hysteria do not lead to good decisions, regardless of the merits of your case. Zweisystem replies: Certainly travel times on SkyTrain itself is faster than comparable light rail lines because it has far fewer stations per route km. Over all travel times via SkyTrain tend to be slow because 80% of SkyTrain’s ridership first take a bus before boarding the metro. The new RAV/Canada Line metro has increased travel times for the over 90% of the ridership who previously took a bus to Vancouver. In some cases what used to be a 40 minute to 50 minute direct trip by express bus is now a 60 minute to 80 minute journey. The speed issue is an illusion by the SkyTrain/metro lobby, nothing more. Rational and customer friendly transit decisions are not made here. The RFV TramTrain proposal envisions a 20-25 minute Scott Road Station to downtown Vancouver travel time versus a 45-50 minute (including transfer) trip via SkyTrain. This editorial was written because of several instances in the past few weeks of the mainstream media (which are pro SkyTrain), making hysterical accusations about light rail, especially operation at grade, echoed on the many local and not so local blogs. What is not mentioned is that SkyTrain’s annual death rate is about 2 to 3 times higher than Calgary’s C-Train, with both systems carrying about the same daily passenger loads. To top it off, SkyTrain elevated and automated metro has all but bankrupted TransLink, the operating authority, even though the province has picked up most of the construction tab. Toronto does have signal priority for the tram lines. Unfortunatey the TTC does not have the power to implement signal priority. The City traffic department is reluctant to turn it on for some reason. Zweisystem replies: Sounds like the ‘Roads’ Lobby in full swing. One wonders if the Egineering cabal in Toronto, like Vancouver, despite what is said is pro car and plans and ensures the city serves the needs of car drivers first and transit customers second. Correction, in Vancouver transit customers come after bicyclists! Where did you pull that number from? Yes, switching from the 98bline to canada line and terminating the 600 series at bridgeport has inconvenience a lot of commuters. Probably we lost a significant portion of those commuters going back to driving. But that is insignificant to the number of new riders the Canada line has attracted. There is nothing wrong with having stations placed far apart; that’s how a regional commuter line works, and it has its place. The question is “does broadway serve regionally or locally?” Clearly, it’s regionally. A commuter from Burnaby would not want to be stuck in a LRT that stops ever so often. Zweisystem replies: So illustrates the delusions of the SkyTrain lobby. What is the point of a transit system if customers find it hard to use because of a lack of convenient stations. The Canada Line a success? All it has done is give former bus riders an inconvenient transfer and longer journey times. I do not see even a hint of a modal shift from car to transit and those 200,000 car trips taken off the road each day, as claimed by the Premier, is nothing more than stuff and nonsense. Until the RAV/Canada line actually caters to 400,000 customers a day, it will be financial drain on the rest of the transit system and the taxpayer. I thought I was clear, but apparently not. Those former bus riders (I’m assuming from the 600 series) are insignificant compared to the number of new riders the Canada line has attracted. New riders because the Canada line has convenienced significantly more commuters, hence the large ridership. The fact that you do not see a modal shift does not matter. The fact that the Canada line has gained so much riders definitely says something. And Please back up that “400,000 customers a day” with a reliable source. Zweisystem replies: Sorry old chum, you are full of it. All bus services include the 300 series from South Surrey; the 600 series from Ladner and South Delta; and the 98-B Line buses & 400 series of buses from Richmond = about 90% of RAV ridership. The only reason to invest in transit is to achieve a modal shift. if not, just operate with buses. Again, despite the hype and hoopla of the SkyTrain/RAV Lobby, the Canada Line has achieved very little, except hasten TransLink’s financial chaos. As for the 400,000 number, it comes from UBC prof. Condon, the other figure used by credible planners is that average hourly ridership should exceed about 15,000 pphpd (with much higher peak hour ridership) to justify the cost of a subway. Of course in LOTUS Land, where everyone is with Lucy in the Sky with Diamonds, metros and subways cost less to build and operate than LRT. Where are you getting this 400,000 passengers/day number from? What are you basing it on? Zweisystem replies: Actually the 400,000 figure came from UBC Prof. Condon. I completely disagree. There are small (and larger) businesses all along the Broadway corridor. A driver who wishes to travel “regionally” takes Grandview Hwy / 12th. Broadway has too many stoplights and buses and parallel parkers. I enjoyed: the speed of travel (lucky me that my destinations were close to stations), and the relative smoothness. I didn’t like: the noise, the lack of stations, and I didn’t like riding across Vancouver underground. I also didn’t like the lack of rail service to the valley, which could have easily been achieved for the same cost if the Canada Line was designed as at-grade LRT. But the line did not get me out of my car – I didn’t have one. If I had one, I think I still would have chosen to drive, Canada Line or no Canada Line. The small time savings I experienced would not have made the difference between choosing to drive and choosing to take transit. The really sad thing about the Canada Line is, suppose we DO begin to see a car->transit mode switch… the line, with its small underground stations, would very quickly fill to capacity. We need a much more convenient, comprehensive enjoyable transit system (that includes the whole Lower Mainland), with active traffic calming as Zweisystem mentions, and people WILL begin to make the switch from car to transit! Distance-based car insurnace would also help. Toronto’s whole TransitCity initiative isn’t going to work very well if the city itself refuses to cooperate. The City of Vancouver claims to place pedestrians first, cyclists second, transit third, goods movement fourth and everybody else after that. In practice, however, the order is quite different. I’d say the current administration puts cyclists first and then gets confused about who to put next and winds up choosing a different group in every location. Dead pedestrians get crosswalks; developers get forced to build parking lots, turn lanes and traffic signals for cars; the truckers own Clark Drive/Knight Street; and transit gets talked about. Many people like the speed of SkyTrain, but don’t fully understand that it came at great cost to them in other ways too numerous to list. The only real winners are the land owners and developers who were able to convert industrial land in Burnaby, New West and Surrey into high density commercial and residential. Even viewed from purely an operational standpoint the lines fail to meet the needs of most users. The only people who seemed to matter in the design of the Expo line were those wanting to travel between town centres, yet curiously New Westminster is almost completely by-passed. The line passes through areas where development still hasn’t happened after 25 years and is unlikely to ever happen in such a way as to support additional stations. Speaking of stations there are almost none away from the windfall developers’ new buildings, but hey, end to end speed is terrific. The Canada Line was clearly built with only one operational goal in mind: the shortest possible travel time from YVR to downtown Vancouver. Who knows what prompted the NDP to put SkyTrain in the middle section of the Millennium Line when it was immediately obvious that by doing so they wouldn’t be able to afford to build the important Vancouver and Coquitlam sections. What could possibly have convinced them to abandon common sense and embrace something that benefitted Gordon Campbell’s best friends? Please stop your unsound speculation — “The new RAV/Canada Line metro has increased travel times for the over 90% of the ridership who previously took a bus to Vancouver. In some cases what used to be a 40 minute to 50 minute direct trip by express bus is now a 60 minute to 80 minute journey. “??????? There is indeed certain small % of transit riders affected, but at the same time, there is some prime example of people live in 10 minutes walking distance to one of the Richmond stations and have their travel time cut by up to 45 minutes a day (both ways combined). If you cares about those former express bus users, they likely consists of less than 10% of total Canada Line. Bridgeport station, where a vast majority of former express bus terminates, is not even in top 5 most busiest stations by observation. Waterfront, VCC, Broadway-CityHall, Langara, Richmond-Brighouse are the most busiest stations. Please take Canada Line five days a week for a continuous month yourself, before making false comments on Canada Line ridership. Zweisystem replies: Everyone who takes a bus to the RAV/Canada Line and whose destination is not downtown Vancouver has seen travel times increase. There are no false comments here, rather it is the SkyTrain/RAV lobby that continue to be very economical with the truth. 80% of SkyTrain’s ridership first take a bus to the metro (Drew Snider, TransLink); the RAV/Canada Line’s ridership is mostly made up of the former Cambie St. bus customers; South Surrey/Delta buses and the Richmond 98-B Line rapid bus, and all other buses except for one that goes to UBC and one that goes to Metrotown. There is no evidence that the RAV/Canada line has attracted much new ridership except for a few casino goers and a few passengers to the airport. The time saving which South Delta/Surrey customers see does not come from RAV, rather it comes from the new Bus HOV lane from #5 road to Cambie. For many whose destinations are on Granville St., a no transfer journey has become a 2 transfer journey; UBC has now become a 2 transfer journey from a 1 transfer journey. As for Richmond, RAV is totally useless for domestic travel, rather it is only acts as funnel to take commuters (the majority must take a bus to RAV) North. RAV will never be extended in Richmond and will not alleviate car use in the city. on the whole, the outlook for Richmond with RAV is exceedingly dismal. The only person that has told Zwei that RAV was great, never actually rode the metro, but formed his opinion from the Bill Good Show! If LRT had been a used on Canada Line, then what would you do with the 300’s, 600’s, and buses from suburban Richmond? Would you run LRT and STILL have the previous bus routes along side? Or would they have to transfer to LRT to get downtown? Would you have LRT and interurban buses, or make them Transfer? If you say keep the buses the way they were, then why have LRT at all? If you say they should transfer, then what is the difference between LRT and light metro? If you are going to have transfers, as even LRT can’t do point to every other point, then your use of the transfer argument against Skytrain seems hypocritical. Transfers are going to be needed for any conceivable LRT network (bus to train and even train to train). In defense of transfers, I find my travel time from White Rock to be substantially shorter into downtown now than it was before. Not only is the trip itself shorter, but the bus is now much more frequent and is unmolested by typical congestion. The 351 now comes by on average every 15 minutes, and during peak hours, it is still busy, if not more busy than before. As well, transferring at Bridgeport offers direct access for travelers to the Airport and Richmond, and even the ferries. Before you had to transfer in CoV, then travel backwards. The bus travels from White Rock to Bridgeport faster than it used to take the bus to get from White Rock to W70th Ave, and transferring to the Canada Line and using it takes less time than driving through the city. As well, Langara, Oakridge, and City Hall are much more interesting destinations for travelers than anything on Granville. Zweisystem replies: If LRT was built to Richmond, it would terminate in Steveston and Ironwood Mall (#5 road and Steveston HWY), the only bus services to be discontinued would have been the Richmond to Vancouver buses. As for a decrease in travel time, the new HWY 99 BUS HOV lane is the main reason for reduced travel times, not RAV. “the RAV/Canada Line’s ridership is mostly made up of the former Cambie St. bus customers; South Surrey/Delta buses and the Richmond 98-B Line rapid bus, and all other buses except for one that goes to UBC and one that goes to Metrotown. “??? you obviously know not enough about transit pattern in Vancouver. The most packed bus in current translink system, #49 bus, goes exactly between UBC and Metrotown. Whether it is eastbound or westbound, the amount of #49 passengers that connect to Canada Line is now phenomenal high. Though I don’t want to speculate a figure, I am pretty convinced the number of customers who use #25, #33, #41, #43, #49 (all east-west bus routes) altogether to transfer to Canada Line is in tens of thousands range daily. you are more in right track for this comment. However, you may be shocked by amount of people taking just one stop (Aberdeen-Lansdowne or Lansdowne-Brighouse) if you ever take RAV. Zweisystem replies: the number of south Surrey/Delta and Richmond bus passengers amounted to about 30,000 a day, that = about 60,000 trips a day (most commuters go in and out) add the Cambie St. bus passengers, 5,000+ gives about 70,000 trip a day. Factor in TransLink’s habitual over estimation of ridership by about 10%, give a negligible ridership increase. All we have done is spend close to $3 billion on a metro to give bus passengers a more inconvenient trip! 4 minute to 10 minute headways would cause congestion at the small RAV stations. After decrying an “abstract rule” that’s actually the result of taking current construction costs and working out the number of people required to cover those costs the quoted author then proposes his or her own rule about how many people a transit service will attract basing it solely on total market size and travel time. Most supporters of grade separated systems do not seem to factor in the time it takes to travel between their grade separated system and actual destinations. They live in a dream world where everyone lives and works within a short walk of a station even though they design systems with as few stations as possible to maximize speed. In this dream world travel time is more important than comfort, convenience, reliability and cost. Apparently money grows on trees because the negative impact on the rest of the transit system of spending a fortune on a grade separated system is never considered and their ridership projections never consider that 3 or 4 at-grade systems could be built for the same budget as their single line. It makes you wonder if supporters of grade separation actually use transit at all because the primary beneficiaries of grade separation are car and truck drivers who don’t want transit vehicles getting in their way. The ridership of the Canada line is 90,000+, occasionally breaking 100,000. I don’t have time to search the stats, but the 98bline and all the other buses cut short of their original route combined had nothing close to that. Zweisystem replies: Rubbish, the last quoted ridership figures were 83,000 a day. Zweisystem replies: I am not going to carry the argument to his blog, I have posted enough information on his blog. Is the number regards to RAV? Broadway corridor subway? or subway in any place of the world general? For Canada Line, 19.2 km, it means 20833 passengers per km. You can do the maths yourself, none of the US and Canada’s real subway system (Toronto, Montreal, NYC, Washington, etc.) have above 20000 passengers per km. Zweisystem replies: More gibberish, as you don’t make any sense at all! Toronto’s & New York’s subway lines do carry over 20,000 pphpd in the peak hours, thus justifying subway construction. It seems you are the person who can’t do the maths or even can understand the problem. But on BCPhil’s point, if there was surface LRT on Cambie, what would you do with the Cambie bus line? Would you eliminate it all together and force a transfer? Keep it and put a bus route on a surface road made smaller by the LRT? Land shaping and speculation also happens with LRT and TramTrain; it was even highlighted in this blog. Not that it’s a bad thing, land use and transit infrastructure go hand-in hand. Land developers always win and that’s to be expected. The London Underground built prior to WWII was funded almost entirely by land developers reaping the benefits of the new rail lines. Supporters of LRT want to see development along the lines too, but LRT doesn’t require nearly as much density because of the lower costs and higher number of stations. Successful LRT lines are customer focused. Station placement is done to maximize the number of route miles within walking distance of a stop. In an urban environment stations are relatively close together so the entire line can develop. Costs are low enough and individual stops relatively equal in importance so there’s no intense pressure to densify, just the opportunity for everyone to do so. Metro uses service speed as its selling point and thus builds stations only when necessary or particularly expedient. That means huge projects with extremely high density at a few select locations and no stations at all between those nodes. A prime example is the route between Patterson and New West. There are three closely placed stations in the Metrotown area followed by just two isolated stations between Royal Oak and New Westminster. Zoning changes to support the town centre development put pressure on the adjoining areas, but since they lack a station within walking distance they developed in an auto-centric manner and required expansion of the road system. So metro construction and road construction, high density and low/medium density go hand in hand to ensure there’s more cars on the road after the transit line opens than before it was even on the drawing board. Metro construction all over the world has shown the same results. Because of the scale of development needed to support a metro only the biggest developers get in on the action. That’s a reason why governments supported by big business favour metro. Big projects command lots of attention that also helps re-election campaigns. Smaller scale transit oriented development can provide just as many units of housing and just as many jobs while being more sustainable, but don’t provide monuments for politicians to be remembered by. Zweisystem replies: Just a note – the original SkyTrain Line and its extensions to Surrey, were built to be completed for the then social Credit government election windows. It’s true, actually. Same goes with advocates of building expensive subways where demand does not warrant one. They do not want lanes taken away from autos. Zweisystem replies: Have not these chaps ever hear of ‘Peak Oil”? When the effects of Peak Oil shape our future economics, there is going to be a lot of free road space! Glen Clark and the NDP building the M-line? Pro-business Houston and Dallas building LRT? When oil reaches $200/barrel, people will be demanding a high quality transit system, one that is robust and regional. In Greater Vancouver, I hope that Skytrain, tram, LRT and buses will all be used. And IMO nothing currently matches the speed of skytrain. If you build on-street LRT, you will slow surface traffic and remove street parking. LRT will also have some delay from street traffic. This is not necessarily a bad thing, but it depends on context and the corridor you want to serve. Why did Dallas build with LRT? Why is San Francisco expanding its subway system? Why did seattle build LRT with guideways and tunnels? And @Zwei, i am still wondering how surface buses would work out on Cambie St if the Canada Line was LRT. Zweisystem replies: Mezz, you still do not get it and I am sorry for you. If LRT operated on Cambie St. (and I never advocated for LRT on Cambie St.) with stops every 500m to 600m apart, there would be no need for buses. LRT replaces buses old chap, that is why LRT is built – IT BECOMES MORE COST EFFECTIVE TO OPERATE THAN BUSES WHEN RIDERSHIP ON A TRANSIT ROUTE EXCEEDS ABOUT 2,000 PPHPD. Operating buses in conjunction with RAV on Cambie St. just drives up the cost of transit on the route. It seems Vancouver gets a lot of transit perks. LRT does not slow surface traffic, streetcars might. Would you have us get rid of all light controlled intersections in Vancouver because they slow traffic? No? Then why would LRT at light controlled intersections create such havoc. In the USA, the auto lobby is strong and forced planners to elevate lines. The BART system is indeed planning expansion, but it serves a population far greater than Vancouver. Also BART is ‘broad gauge’ and is not compatible with existing rail infrastructure, so it is very expensive ‘Greenfields’ construction all the way. With California’s economic woes, one doubts that much money will be spent on metro and instead fund much cheaper at-grade LRT projects, if at all. Seattle’s LRT system is a grossly overbuilt hybrid light-rail/metro with some at-grade operation (in unpleasant neighborhoods!). Again, Seattle illustrates the stupidity of building hugely expensive faux metro on a route that nowhere has the ridership to sustain it. Again, economic pressures in Washington state may force much cheaper true LRT solutions on the region. Now for SkyTrain’s speed, it is fast because it was designed with fewer stations. When TransLink designs LRT, it designs it to be slow – simple. Any transit system is as fast or as slow as it is designed to be and has nothing to do with mode (LRT or metro). Peak Oil will devastate regional transit as most of our buses run on ‘oil’ and they take 80% of SkyTrain’s ridership to the stations. Vancouver’s poorly planned and very expensive metro system will cripple the region, as it will very expensive to operate the buses to serve the metro, further driving up costs. If LRT stops were 500 m apart, you’ve put 20 stations in Vancouver alone on Cambie street to downtown (10 km from Marine Drive to Waterfront). Even more if you use the Arbutus Corridor. I would think these stations would be inexpensive to build, but I would not know the impacts of travel time this would have. And in consideration of passenger flows to/from stations, you would have to slow surrounding traffic down. Again, not a bad thing but we would have to be aware of it and plan for it. By having a LRT spaced like that, you have increased the spacing from local bus service (every 250 metres) to the lower end of B-line stop spacing (every 500 to 1500 metres). Again, not necesssarily good or bad, but this is what you are comparing to our existing Canada line. Zweisystem replies: Mezz you are wrong. You scoff at the main reason for LRT/tram’s success – easy access, affordability, reliability. Look at transit systems across the pond and tram stops are about 400 (older systems) to 600 metre apart. Of course in suburban areas stops are much further apart, but if you want to attract customers, the 500m to 600m spacing is desirable. Remember with LRT dwell times are about 15 seconds not the 30 to 50 seconds one finds with SkyTrain. Of course you leave out operational costs as what you propose is very labour intensive, unlike LRT. I’m, sorry, for what you propose, it is easier just to take the car and in the METRO region this is just what potential transit customers are doing. The above system is from you noted how Cambie LRT should be. If you disagree, again I ask how would you run Canada Line LRT? If anything it sounds like you’d rather take a car than ride Canada Line as LRT. And you are mixing LRT arguments with tram points again. Zweisystem replies: A hypothetical LRT line along Cambie St. (only) would run mostly on reserved rights-of-ways and have stops ever 500m to 600m. Trains would be 4 minute headways peak and 5 to 6 minute off-peak. Remember light rail/tram is faster than buses, without any transit priorities and a tram operating as LRT with Reserved R-O-W’s would have commercial speeds approaching a metro, with double the stops, because light rail has much faster acceleration and deceleration and shorter dwell times, than a metro, including automatic metro.LRT is a tram, but a tram operating on a Reserved R-O-W. I don’t think the word delusional is appropriate in this case. Mez seems to be trying to get explanations and is simply copying data from TransLink about stop spacing. I’ve been a regular reader of that TransLink blog and they recognize that stops are too close together on many of their older routes, but don’t want to disrupt users by eliminating any. However, on new routes they are going with fewer stops to speed up the bus and get people used to the fact that there can’t be a stop on every block. I really like the stop spacing on the #33 bus. Except where it shares stops with older bus routes the spacing is relatively wide, in the 300-400m range. The buses still run relatively empty on the east side, but it’s only been around for a year so ridership is still growing and my wife has ridden crowded buses in the Arbutus to Cambie segment. Zweisystem replies: Rebuke accepted and said phrase has been edited out. I think is was the three abusive comments that I did not print got the adrenalin going. As for stop spacing, a great deal of study has been taken and the 500m to 600m stop spacing for LRT/tram is the optimal distance. This sounds like my first description of Cambie LRT, yet you raised issues with operational costs. Again, not necessarily a bad thing – you have to compare to capital costs of skytrain. But I acknowledge skytrain capital costs are expensive. You are stating that labour costs and staffing may be issues with LRT. This was you proposed. And the above opinion was your opinion. Why is it easier to take the car? Here’s my opinion – you removed the local bus and replaced it with something that marginally improves on B-line service and spent hundreds of millions in the process. Zweisystem replies: Operating cost on light rail are cheaper than buses when ridership exceeds about 2,000 pphpd, thus over a 20 to 25 year period, the savings in operating costs tend to pay for tram installation. Also LRT is very good in attracting ridership and the service could be attracting twice the ridership than buses. Taking the car is always easier, that’s why it is extremely important to design a transit system to be attractive to use, that means convenient stops and no transfers where possible. One just build light rail for the sale of building light rail (something like the Canada line, but when there is a proven demand for the mode. in the real world, the RAV/Canada line would never would have been a subway, but Mr. Dobel wanted a subway and Mr. Dobel got a subway and now we must pay for it. Central Broadway and UBC are the second and third largest trip generators in the region and these should be linked to the SkyTrain rapid transit network using the proven 99 B-Line stop spacing because it would offer high-capacity local service and the shortest travel times for passengers travelling across the region. The principle responses I have observed engage with cost and the technical merit of LRT. I disagree with neither and repeat that Central Broadway and UBC are destinations of regional, as well as local, significance. LRT would be appropriate and desirable in many, many places in Metro Vancouver, including at-grade on Broadway even with SkyTrain running beneath, as is the case with MUNI and BART along Market Street in San Francisco. Furthermore the rapid transit network cannot and will never go everywhere. However the Broadway to UBC corridor is appropriate for SkyTrain and I think it would be one of the last routes in the region where this is the case. Once we have completed the frequent, high capacity rapid transit network with the UBC line we can shift our focus to building out a comprehensive semi-regional and local LRT and tram network. Zweisystem replies: In fact no transit route in Vancouver is practical for SkyTrain and what a lot of people overlook is that despite being on the market for over 30 years and showcased at Expo 86, only the PUTRA in Kuala Lumpor has used the technology as an urban transit or metro system. Toronto and Detroit were demonstration lines and the other three are either airport or funfair lines built with generous financing from the Canadian government. SkyTrain is 1950’s transit philosophy masquerading as 21st century transit. 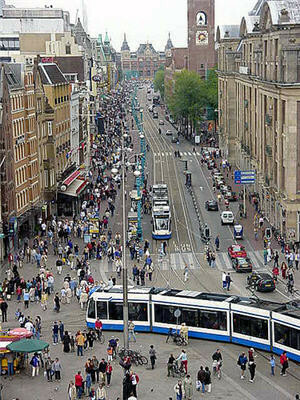 The fact be known LRT, being able to operate on-street in city centres has proven to be extremely popular with planners and customers. To quickly follow up I was referring only to stop spacing for a local bus and said that I felt the spacing used for the #33 was fine. Your recommendation of 500m for a tram seems perfectly reasonable too and would enable the local bus to be removed provided it offered a truly identical service. Broadway also supports 3 trolley services that do not duplicate the #99 and #9 and only use a short segment of Broadway. I would leave them as-is. The west side trolleys to UBC trouble me. Both the #4 on 4th and the #17 on Broadway have lost passengers to express buses in recent years, but provide mostly unduplicated local service. The #7 has also lost passengers to the #32, but that’s a topic for another day. If Broadway gets a tram then most of the #17 route is duplicated with a higher quality service and should be discontinued. However, that would sever the no-transfer direct link between Broadway and downtown except in the short segment where the #16 operates. That bothers me and it’ll take a while to come up with solid ideas for revamping the bus system. If I actually go to the effort of drawing maps for myself I’ll submit my ideas to this blog for publication. Quickly replying to mezzanine above. A tram is hardly a marginal improvement over the B-Line. There is a serious lack of capacity on Broadway and the tram would solve that problem and permit many bus drivers and their 60-foot articulated buses to be re-deployed to other crowded routes like the #49. Zweisystem replies: If a Broadway LRT is built, certainly a downtown link is a no brainer. The Granville St. Bridge was designed to accommodate streetcars and with its most recent seismic upgrading can accommodate LRT. The following ridership information from December 28, 2009 is hopefully not rubbish. If you accept the following figures, then the Canada Line is indeed attracting new riders vs. the buses it replaced, and is increasing over time. Zweisystem replies: First of all TransLink does not say how it counts ridership on its metro system and many believe ridership numbers are merely invented. As for 100,000 number, it’s probably ‘puffery’ from Crombie for the Globe piece, knowing full well no one can contradict him. Until there are independent audits of ridership, as what is the norm with other transit systems, TransLink will claim the moon and the stars for ridership without any worry of audit. Here is a hint: When TransLink guesses ridership numbers it uses a figure of 200 persons per metro car, yet ROTEM only advertises 153 persons (all seats filled and standees at 4 persons per m/2) per car. Has TransLink inflated ridership by over 30%, by claiming 47 ‘ghost’ riders per car? BC Transit did the same with the Expo Line, claiming 300,000 passengers a day at the end of Expo 86, yet the four car trains ran at only 5 minute headways, giving an hourly capacity of 3,600 pphpd!. BC Transit also claimed at the time that they were loading 125 persons in a MK1 car, during the final days of the Expo! This will be my last post on this thread…. Remember that payments to InTransitBC rely on accurate passenger counts using automated counters. There probably is some error with the counts, but both Intransit and translink have a vested interest in accurate counts. I wouldn’t doubt the 100,000 daily ridership. -thanks to Ron C at Stephen Rees’ blog! Zweisystem replies: According to sources, the automatic counters are not all that accurate, if they were you can be assured TransLink would be doing news releases ad nauseum about high ridership numbers, but they disclose through the Globe? Could it be the reason TransLink is resisting turnstiles/fare-gates is that the one thing turnstiles are very good in doing is counting ridership……click…1, click….2, click….3, and so on. As for Ron C., the original SkyTrain lobbyist! Having run some calculations I’m starting to believe that 90,000 is quite possible given the crowded conditions I’ve witnessed on the trains and the surprising observation that a lot of passengers only go a few stops before being replaced by a new passenger. That significantly increases the number of boardings per trip. While the train may have a capacity of just 306 people, with all those getting on and off along the way a full train will likely have carried 500 by the time it reaches the last station on the line. However we must remain skeptical because Stephen Rees used to work for BC Transit and he has stated that in those days the published ridership numbers were invented by staff and were not the result of actually counting people entering stations. I’ve ridden SkyTrain for years and I attended Expo 86 many times with my season pass. The trains were crowded, but nowhere near what BC Transit claimed. You simply cannot cram 125 people into a Mark I without Japanese pushers. The churn of passengers getting on and off along the route, something I’ve noticed is high in the Vancouver segment of Canada Line, was very low in 1986. Most inbound trains were full before they reached Burnaby so the average distance travelled on the train was very high and thus the passenger numbers were only a small percentage above train capacity. It’s unlikely that any 4-car Mark I train carried more than 400 different passengers in the entire run from New West to Waterfront putting maximum capacity at 5000 pphpd. Trains going the opposite direction were almost empty. Even assuming 10 hours of rush hour demand back then, that’s still only 50,000 in the peak direction and a fraction of that going the other way. Off peak numbers during Expo weren’t bad, but the trains weren’t packed all day long. So figure another 30,000 in the off peak hours and another fraction in the reverse direction. At best they probably squeezed in 120,000 on a good day, well under half the figure given above. Zweisystem replies: My belief is that RAV is carrying about 70,000 passengers a day (with a 10% margin of error), but unless I take the time and actually do boarding counts, I can not prove it. I did the same thing with SkyTrain in the 80’s; it took a week but my calculations showed that BC Transit was overstating ridership by a whopping 20%! Hence my conversations with attendants vis a vis Mk.1 car capacities, etc. The real quest about the RAV is: “How many RAV customers have switched from car to RAV?” If the answer is less than 10%, I think it is fairly accurate to say we have wasted about $2.5 billion. Zweisystem replies: I have bruised the SkyTrain/RAV lobby too much this week to say much more on the Olympic wait times. But, if the best that TransLink can do is to tell transit customers to expect two hour waits at SkyTrain stations at peak times, during the two week Olympic charade, then there is something terribly wrong with our transit system and the folks who run it. My guess is that many small businesses will close their doors for the two weeks throwing many people out of work. My wife is a good example, her place of business, located on 4th Ave., has received so many cancellations during the Olympics that the owner has decided to close down for the two weeks. All 6 employees will not work or get paid for two weeks. It seems the Olympic brass get bonuses and the average person gets shafted. An interesting discussion, although difficult to understand at some points. Different modes have their supporters, who in some instances are quite religious about their chosen route to transporation salvation. I wonder what kind of reformed governance structure is needed for Translink, and for Metro Vancouver, and for Metro’s component municipalities, in order to force the production of accurate and reliable data on costs and ridership? Perhaps an ideal for provincial legislation should be to create a class of summary conviction offences offering a few months in jail for officials purveying concocted or doctored data. To some degree this resembles Pentagon procurement. The technologies are complex, the capital costs significant, the lifespans long and the maintenance another considerable factor. Who knows what each system will provide? Why, the manufacturers, of course! And then, once purchased, the officials who chose the systems! Zweisystem replies: I would like to see both TransLink and METRO representatives elected at the municipal level and leave present city councilors to run the city, which they were voted for and not TransLink or METRO, which they were not. Once we have actual TransLink representatives, then the public will have politicos that will deal strictly with transit and transportation issues. In Delta, where I live, municipal councilors are so busy with GVRD/METRO/TransLink issues that they all but ignore local issues. It has gotten so bad that the city engineer informed Zwei that he was in fact, mayor and council! It back to democracy 101, where the people must directly elect all regional METRO and TransLink Board members. The biggest problem we have is that the senior levels of government have a vested interest in the doctored numbers. The Provincial government, as the #1 cheerleader for SkyTrain, does not want an audit that shows ridership is being inflated. Excuse me, Light-Rail-on-street (tram) is a different transport mode to metro, commuter rail, SkyTrain and all. You go for the mode that gives you the service you want at a price you can afford. Your debate would be helped if you weren’t comparing bananas and apples. Local streetcar services, with frequent stops and slower speeds, are fine for local movement. But they are not attractive for longer commutes – come to Melbourne Australia and see for yourself. Zweisystem replies: Studies have shown that there is little difference between over all commute time by one using LRT/tram and metro. One has to take in account that using a metro takes a great deal of time, as the stations are much further apart, etc. Light rail, operating on reserved R-O-W’s, with priority signaling at intersections, is almost as fast as a metro, yet LRT has many more stations or stops.